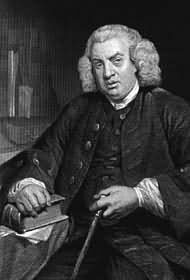 Samuel Johnson (1709-1784), known popularly at the time as Dr. Johnson, was a great writer of the eighteenth century, writing poetry, essays, biographies, and contributing to several journals and periodicals as an editor. He is also famous for writing the first dictionary of the English language, initially published in two volumes in 1755. It took him nine years to write, and by 1785 it had run to six editions, providing a significant basis for other lexicographers to build on in the future. 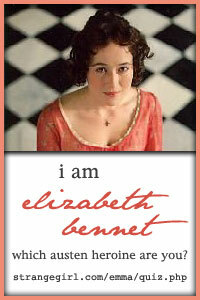 It contained a massive 42,773 words, coupled with examples of word usage from other literature. True to eighteenth-centruy form, even its title was long! A Dictionary of the English Language: in which words are deduced from the originals, and illustrated in their various significations, by examples from the best writers. Here are a few examples of Johnson’s entries. It is a pitifully poor selection when I had 42,773 to choose from, but I hope you understand! Johnson did include some words that were considered vulgar. The first part of this entry includes a quotation from Sir John Suckling. Love is the fart Of every heart; It pains a man when ’tis kept close; And others doth offend, when ’tis let loose. 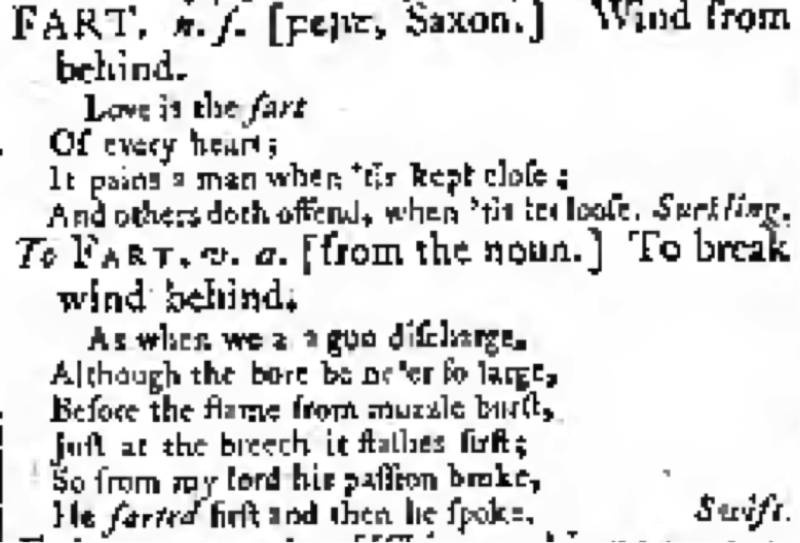 The second part of the entry defines “to fart” as “To break wind behind.” The quotation included here is from Jonathan Swift’s poem, Problem, That My Lord Berkeley Stinks When He Is In Love. As when we a gun discharge, Although the bore be ne’er so large, Before the flame from muzzle burst, Just at the breech it flashes first; So from my lord his passion broke, He farted first and then he spoke. Footpad: A highwayman that robs on foot, not on horseback. 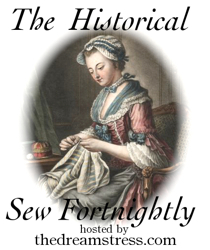 Both highwaymen and footpads were a common occurrence in eighteenth century London. Both offences received the death penalty, usually by hanging from “Tyburn Tree”, which was the wooden structure at Tyburn outside London used for executions. Morrow: The day after the present day. Tenderling: The first horns of a deer. I would love to buy the 1755 Dictionary on CD ROM (published by Cambridge University Press), but it is over $400 AUD. I will have to be content for the moment to drink my cup of tea over my pdf version! Dr Johnson’s Dictionary Online – this website is endeavouring to digitise the entire dictionary, one word at a time! You can also view facsimile pages of the original document. All pictures are taken from scans of the 6th edition of Johnson’s Dictionary (1785).